LAKE JACKSON, Texas — Many would say that there is a science to everything and that science is not for everyone. For 2012 graduate of Huston-Tillotson University, Christopher Woodard, science was everything to him. A native of Angleton, Texas, Woodard declared a major in kinesiology, the scientific study of human or non-human body movement. “I loved science,” Woodard declared. He found this love while in high school at Brazosport High School in Freeport, Texas. He was on the track team there and a member of the National Organization for the Professional Advancement of Black Chemists and Chemical Engineers. 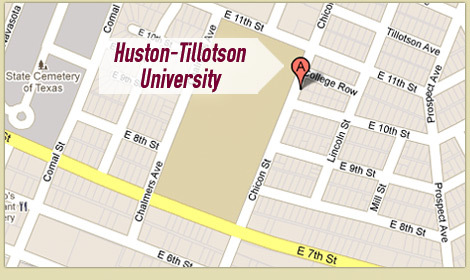 Actually, it was track that landed him as a student at Huston-Tillotson. Woodard was in a track meet at Prairie View A&M University when a Huston-Tillotson track coach stopped him and asked about his college interest. His mom stood nearby, and all agreed to a campus visit that summer. When stepping onto Huston-Tillotson’s campus, Woodard captured the Austin skyline view (or it captured him) from behind the King-Seabrook Chapel. The small class sizes also intrigued him. Without a second thought, Woodard enrolled in Huston-Tillotson University that fall. During his time as a very active student, including track team member, he again embraced his love for science. Despite not liking math, nothing could separate him and his love for physics and chemistry. Nothing also could separate him from his love for Jesus. Later, on Thursdays, Woodard would help lead the Brothers of Fellowship, a men’s Bible Study held in the Beard-Burrowes dormitory. Many students would lift up Woodard, as he was a student leader. Woodard was Mister Huston-Tillotson (with an affiliated role in the Student Government Association), a student assistant in Religious Life with Rev. Donald E. Brewington, and a member of Kappa Alpha Psi Fraternity, Inc. He even started a Gentlemen’s Club. He fondly recalls an event of the Club where the gentlemen pampered all ladies of Huston-Tillotson for Valentine’s Day. Woodard said that the event was scheduled to end at 8:00, but the ladies kept coming. Their reaction? Because of his heavy student activities’ roles, he had to soon withdraw from the track team. Although successful, every day as a student was not easy for Woodard. He shared more about his challenging days and his faith and fellow believers that kept him intact. Today, Woodard doubles as a security guard for Lake Jackson, Texas location of BASF, the second largest producer and marketer of chemicals and related products in North America, and a fitness enthusiast (Instagram: @greekgodbodybuilding). Woodard would agree that he can now not only lift up someone spiritually but also physically. His journey continues. Woodard gives some credit to his kinesiology education at Huston-Tillotson and some to his life of athletics. “I’ve been an athlete all my life. It’s hard for me to sit still. That’s why I’m always on the move.” That makes sense since he is educated in the field that studies body movement. A modest Woodard may not accept being called an expert in the field with such a commitment to staying active, but winning top awards such as first place in his first-ever bodybuilding show may say otherwise. Woodard enjoys the bodybuilding to such an extent that he made it a platform to continue the journey started at Huston-Tillotson of lifting up others. Well, Woodard is well on his way to touching the world as he builds his platform on a holistic journey that fully started at Huston-Tillotson University.